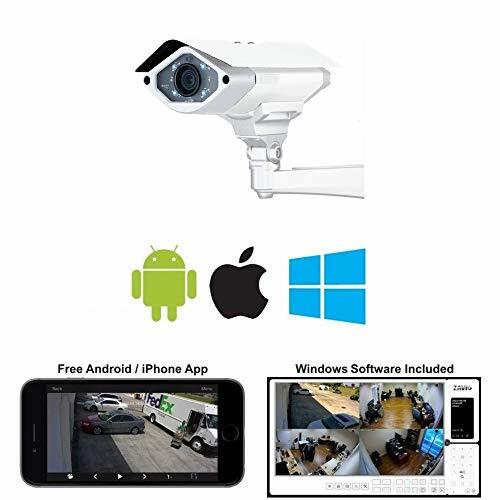 The Zavio B8220 is an IP bullet camera with a built-in LPR mode that is designed to operate in extreme outdoor weather conditions. The LPR mode (license plate recognition) of the camera can be enabled to capture plates from up to 20 feet away from the vehicles. This bullet camera features a motorized 2.8~12mm lens that can be remotely adjusted from the camera’s interface. It records in an HD resolution of 1920 x 1080 at 60 frames per second. In addition, it records using the H.265 video compression to save as much as 50% bandwidth and storage when compared to H.264. The IP66 rated outdoor housing ensures that the vital components of the camera are fully protected from harsh weather conditions, dust, and humidity. It can withstand temperatures ranging from -58°F to 140°F. This is made possible by the built-in heater/blower assembly that automatically turns on and off when needed. The camera can be powered by either 12V-DC or POE 802.3AT (injector not included). For environments with high contrast lighting conditions, the WDR (Wide Dynamic Range) capability ensures that no image is too bright or dark to capture. WDR works by combining the brightest part of the image with the darkest part to create an image similar to that of the human eye. Built-in high powered infrared LEDs have an effective illumination range of up to 50 meters/150 feet and provide visibility in dark environments. The infrared LEDs on this camera use Adaptive IR Pro technology, which allows the LEDs to adjust their intensity to prevent the image from being overexposed. A few more features of the B8220 include (2) alarm inputs, (2) alarm outputs, a built-in Micro SD/SDHC/SDXC Card Slot, and two-way audio support for use with external audio devices. A 64 channel Windows recording software is included. HD Resolution Recording – The B8220 can record in 1920 x 1080 at up to 60 frames per second. 2.8~12mm Motorized Lens – Users can adjust the camera’s from angle of view from 33°~104° remotely from the camera’s web interface. Built-in Infrared LEDs – The Infrared LEDs built into this camera have an effective range of 50 meters / 150 feet and allow the camera to record around the clock. Outdoor Rated Housing – The IP66 rated enclosure protects the vital components of the camera from harsh weather and extreme temperatures. 64 Channel NVR Software Included – Turn your Windows PC into a Network Video Recorder (NVR). Record video from up to 64 cameras. Login remotely to view all of your security cameras live.